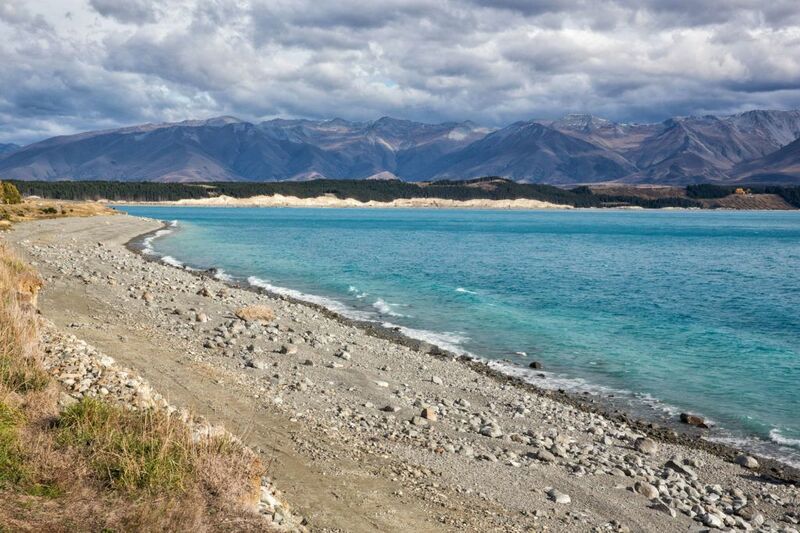 The second half of our New Zealand adventure took us through the North Island. 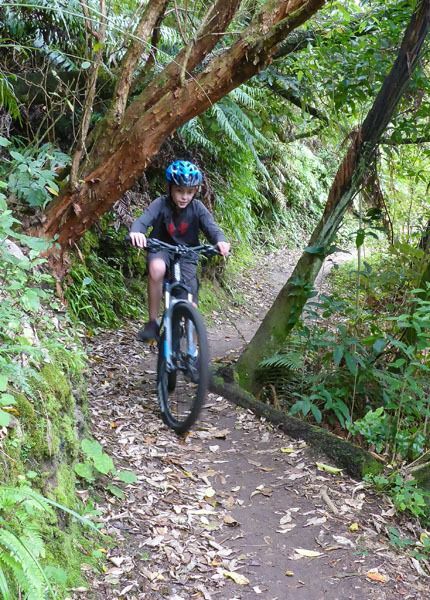 Although the North Island lacks the stunning scenery that we were wowed by on the South Island, there are still heaps of fun activities for families. 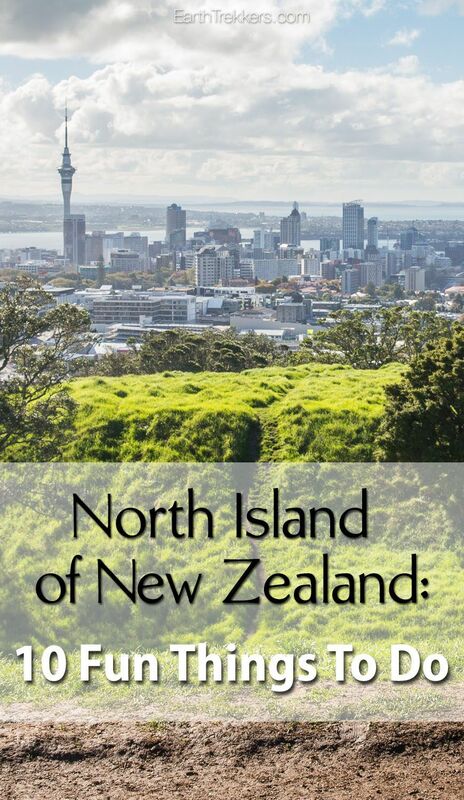 The North Island has it all…beaches, volcanoes, fabulous cities, famous movie sets, more adrenaline generating activities, and even caves filled with tiny, glowing worms. Like always, we were very busy, hopping from one town to the next, eventually ending at New Zealand’s largest city, Auckland. Of the multitude of things we did on our North Island tour, here are some of our favorite activities, including one we could have done without. For movie fans, young and old alike, this is a cool, quick stop. We took a tour of the Weta workshop, learning the basics on how movie props are made and getting a brief introduction into digital effects. Tyler, with his RTW video blog project and his growing obsession with robotics and computer programming, found this fascinating. Maybe we’ll see him working in the film industry someday. 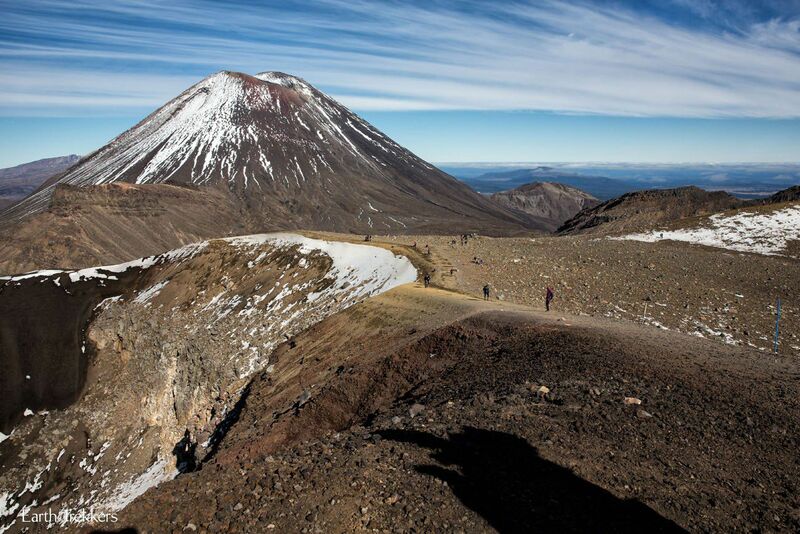 The Tongariro Alpine Crossing blew away the other hikes we did while in New Zealand. The ever changing scenery, the 360° views from the summit, the smelly, sulfur filled air, along with views of a steaming, active volcano, made this one of our favorite hikes in the world. It is a 19.4 km hike and quite strenuous at times, but we saw a family with kids as young as five years old who were doing very well. 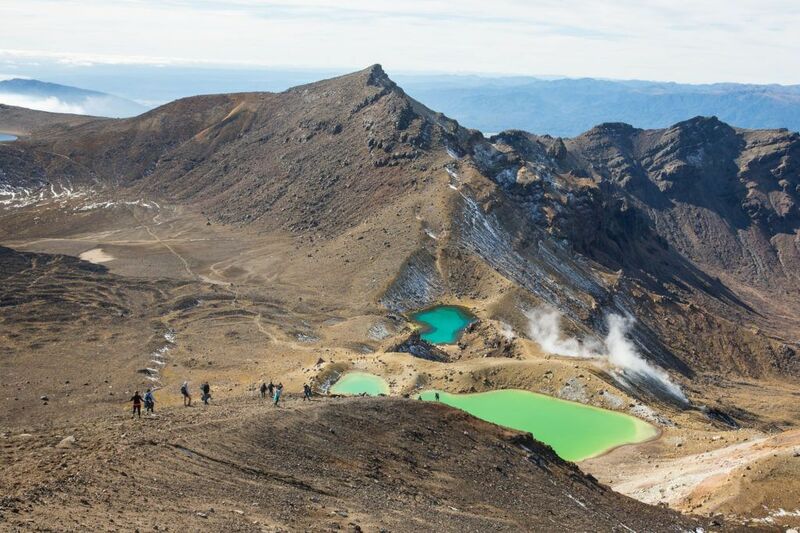 If your kids are active and adventurous and love the idea of hiking around an active volcano, do not miss this hike! After bungy jumping in Queenstown, this was our second favorite activity in New Zealand. Taupo, the adventure capital of the North Island, is very similar to Queenstown on the South Island. Here you can go bungy jumping, jet boat riding, paragliding, and skydiving. To us, Taupo just did not have that same vibe that we felt in Queenstown. Here in Taupo, things were quieter and more sedate and the town seemed a lot sleepier. 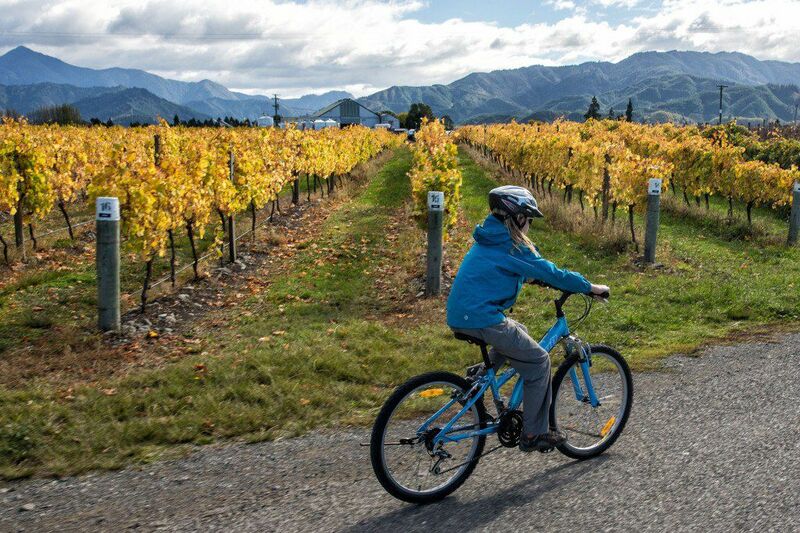 Having partaken in most of the same activities in Queenstown, and not willing to spend the exorbitant $1300 USD to go skydiving, we chose the much cheaper option of mountain biking. 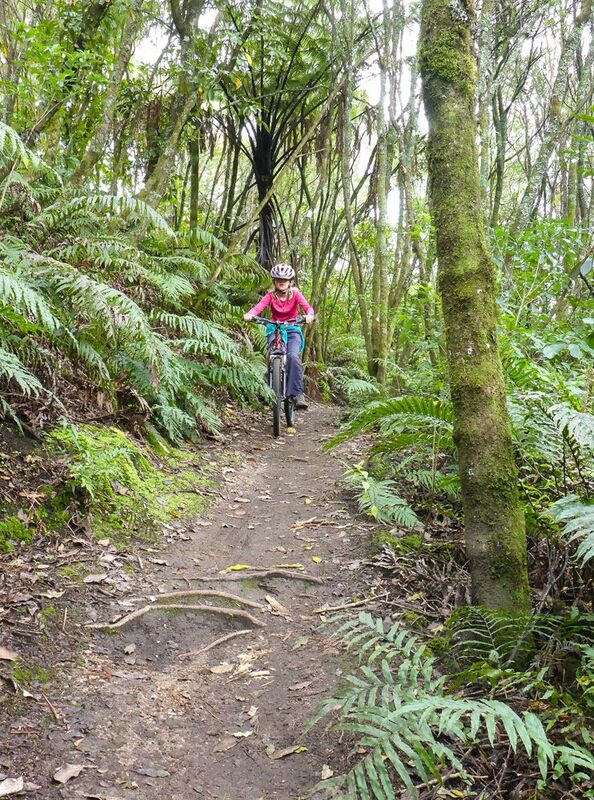 Taupo is laced with many trails of all difficulty levels, perfect for our family. This would be Tyler and Kara’s first time truly mountain biking. Time for another adventure! 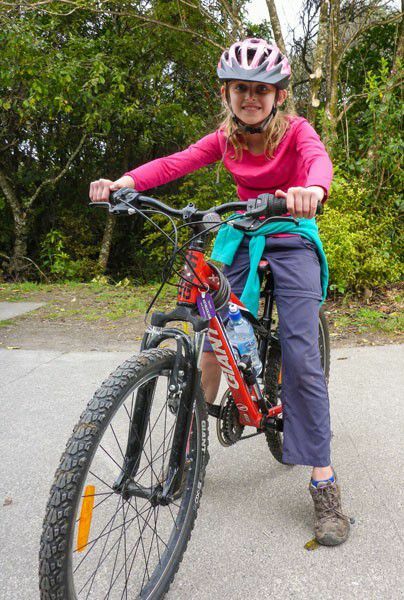 On our rented mountain bikes we headed north out of Taupo, biking along the Huka River to Huka Falls. For Tyler and Kara, these trails were relatively difficult. There were no logs or obstacles to jump our bikes over, but there were plenty of steep gradients and hairpin turns on the sides of canyons. For me, it was a little nerve wracking. I worried that Tyler or Kara would go flying off of the trail and down into the valley ten feet below. Having broken my hand while mountain biking in Peru, I know how easily these mishaps can occur (I didn’t go over the side, I just fell awkwardly on the trail, breaking my left hand and earning me a trip to a clinic in Cusco, but that’s another story). Tyler and Kara did great, and none of the horrible images of wipeouts, collisions, or tumbling down to the river below came true. They amazed Tim and I with their bike handling skills and ability to keep their bikes on the trails. For most of the time they had fun; there were several uphill sections that had us walking our bikes to the top. The best part of the day was the trail back to Taupo, a trail that took us through eerily quiet Redwood forests on easier trails. 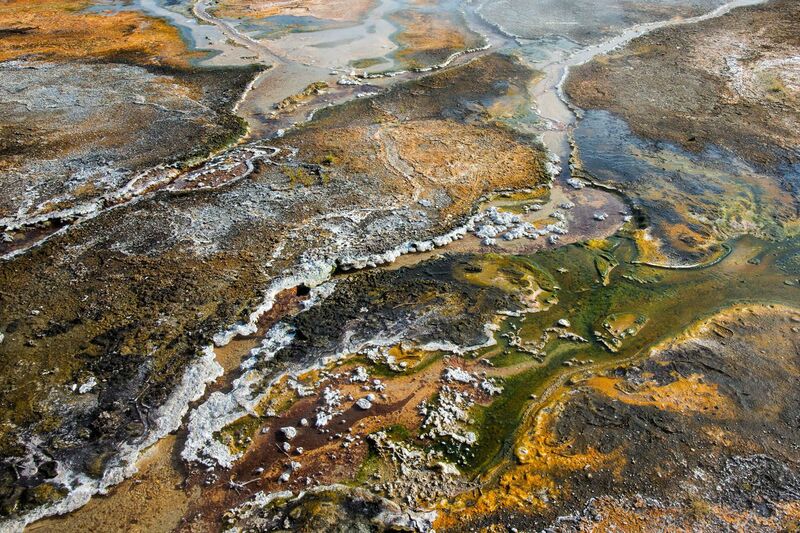 Rotorua is New Zealand’s stinkiest city. The entire city smells like rotten eggs, the smell coming from sulfur bubbling up from neighboring hot springs and geothermal hot spots. I do not know how people stand to live here. There is almost no way to escape the smell. It was in our car, in restaurants, even in our hotel room, and for us, there was no getting used to it. Fortunately, we only stayed here for one night before we moved on to fresher air. 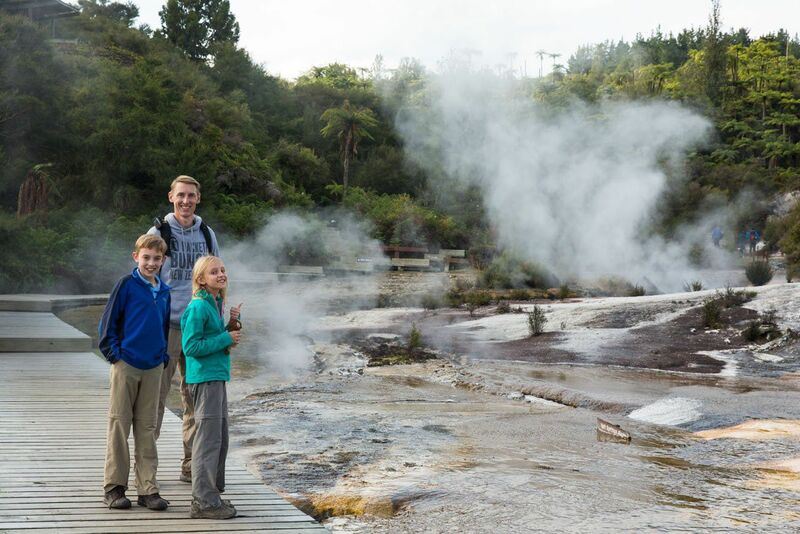 Despite the smell, Rotorua is still worth the visit. 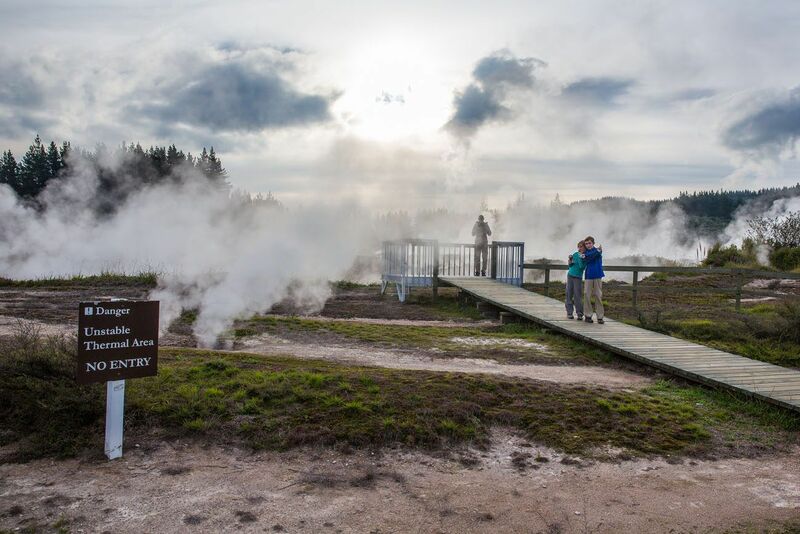 This area of New Zealand is similar to Yellowstone National Park with its bubbling mud pots, geysers, and wet, crusty, multicolored landscapes.Tyler and Kara saw their first geyser eruption, and even though it was no Old Faithful, it still elicited whoops of surprise and enjoyment as boiling hot water erupted from a hole in the ground. The best part were the gurgling, almost calming burping sounds the boiling mud pots made. I do not know what is so fascinating about watching bubbling mud, but we were transfixed. The Hobbiton Movie Set Tour was a huge hit for our family. Tyler and Kara have always dreamed of having a tree house, but if given the option, a child-sized cottage built into the hillside just might beat a house up in the trees. 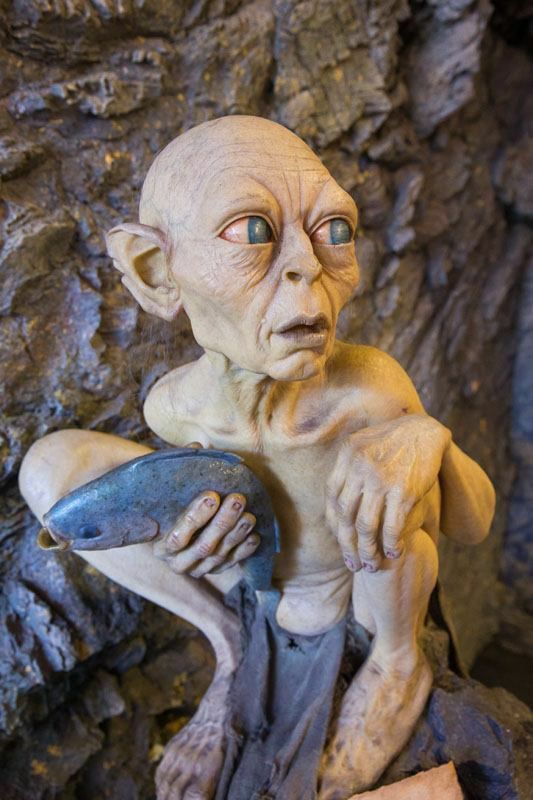 What was designed as a movie set is now a huge money maker for the Alexander family, a family who just happened to own the perfect looking piece of property for “The Shire” in Peter Jackson’s eyes. It is amazing the level of detail that went into designing this set, everything from the scale of the houses to the landscaping to prop design. Being here almost made Tim and I feel like kids again, wanting to run and explore these tiny hobbit houses and hideaways. 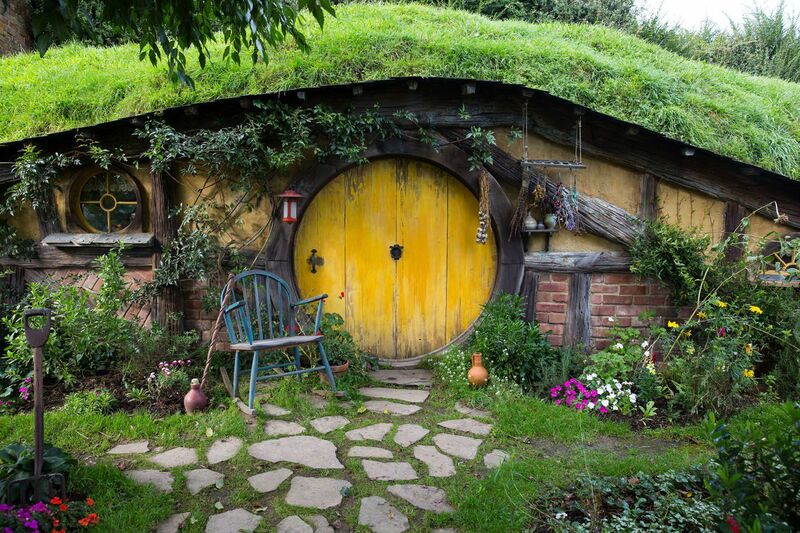 You don’t have to be a Lord of the Rings or Hobbit fan in order to enjoy a visit here, but it helps to be a kid at heart. 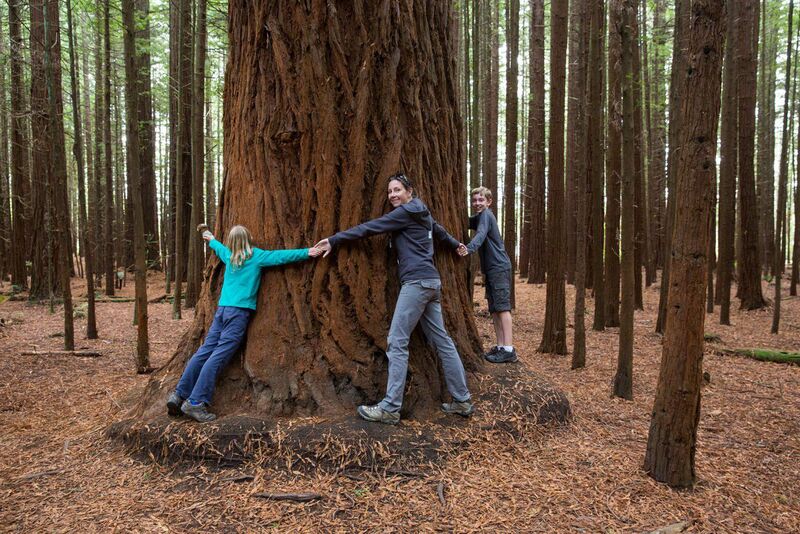 Located just outside Taupo is a forest of California Redwood trees. Again, this was a first for Tyler and Kara, a walk under some of the world’s tallest trees. 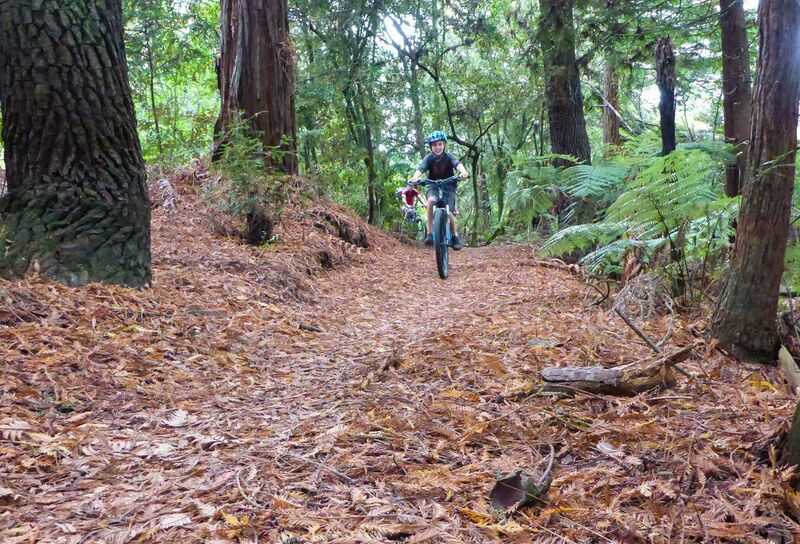 This forest, Whakarewarewa Forest, is enormous and you can spend an entire day walking the trails here. I loved this place. We felt tiny here and these Redwood trees were not anywhere near full-grown, leaving us to wonder how old this forest really was. We did not see any trees large enough to drive a car through, and that may still be a thousand years away, but there was still something almost mystical about walking through this forest of giants. 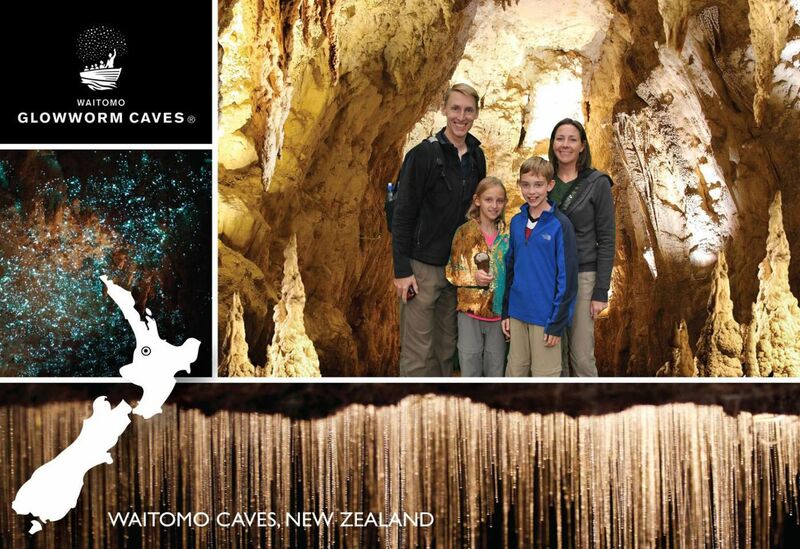 The Waitomo Glowworm Caves, Do Not Miss This! Imagine entering a completely dark cave, looking up, and having it look like you’re staring into the night sky above. The Waitomo Glowworm Caves sounded fascinating when I read about them, but seeing them blew us away. There are multiple ways to tour the caves. The coolest way, in our opinion, would be to go black water rafting (white water rafting through caves) or tubing on the rivers that run underground here. Unfortunately, there is a minimum age of twelve years in order to do any “wet” cave exploration, so we were left with a “dry” tour. This was still amazing. Our tour guide had us all climb aboard a rowboat without oars or a motor. Using ropes strung up through the cave, she guided us into the darker part of the cave. We all stared at the ceiling in amazement. Above our heads were thousands of tiny glowworms, almost twinkling like the stars in the night sky, one of the coolest things we have seen yet. The only sounds we could hear were the eerie, periodic dripping of water onto the river we were drifting on. Unfortunately, there is a no photography policy in all of these caves, including the black water rafting caves, so my only photo is this souvenir photo we bought upon completion of our tour. We arrived in Auckland on a rainy day and needed something to do. 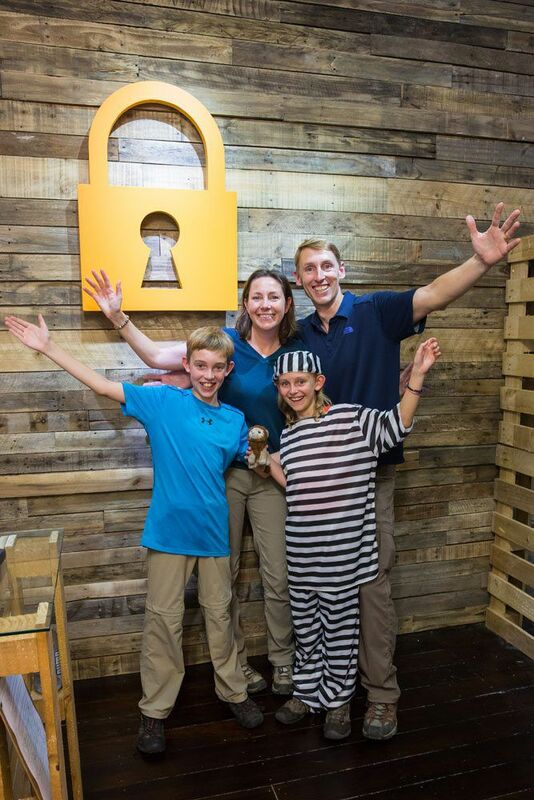 Having heard about these games where you are locked in a room for an hour and have to use clues and answers to puzzles to escape, we decided to give it a try. We are always up for another challenge! There are two companies that operate escape games in Auckland and we randomly chose Great Escape. The four of us were locked in a prison cell. Using the clues provided, we had to figure out how to escape from the room. It was mentally challenging, had us thinking outside of the box, and it was a great teamwork activity. Yes, we managed to escape with one minute to spare, just before the warden discovered what we were up to. As a family we love puzzle games, and a hands on race against the clock like this was perfect for us. We loved it so much that we went back for more. We did the Zombie Escape experience with Escape Masters, but their game was nowhere near the level of quality and intricacy as Great Escape. 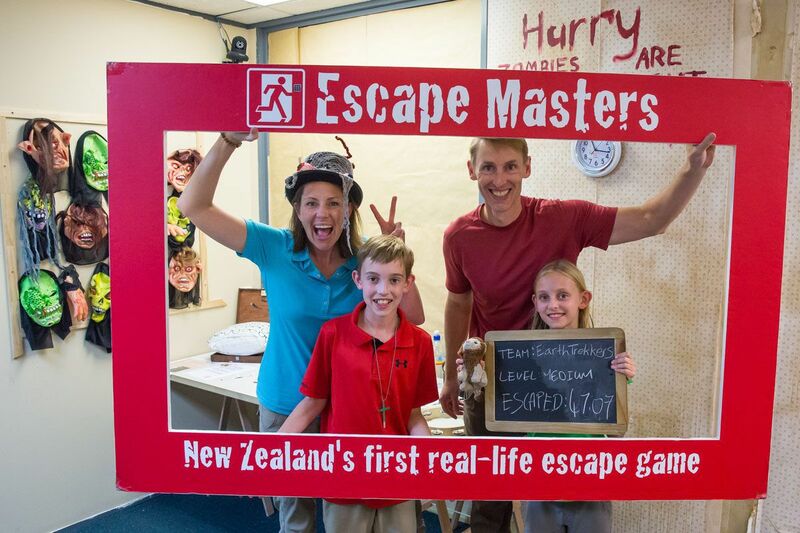 On our final day in Auckland we went back for round three, escaping from the insane asylum with Great Escape again. This is fun for our entire family. The hunt for clues, deciphering codes, unlocking more drawers for even more clues, we all had a blast. This is best for those twelve years and older, but even ten year old Kara contributed a lot and had just as much fun as the rest of us. Our family will be on the lookout for these games as we keep traveling. If you are in Auckland and want to play a game, go with Great Escape, these games are so much better. I’d tell you why but I do not want to give anything away!!! 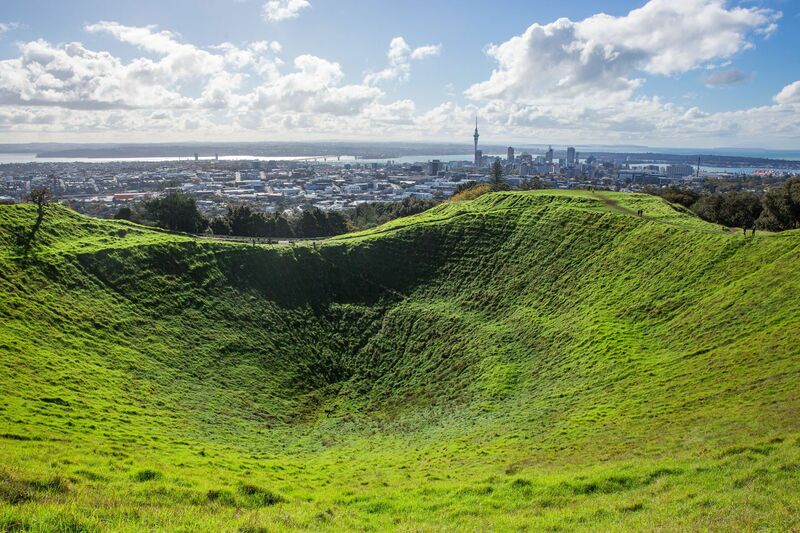 There are probably fifty amazing things to do while in Auckland so we had a hard time picking what we wanted to do during our two and a half days here. Not a bad problem to have. On Mother’s Day, we went on a daytrip to the western coast, just forty-five minutes outside of Auckland. 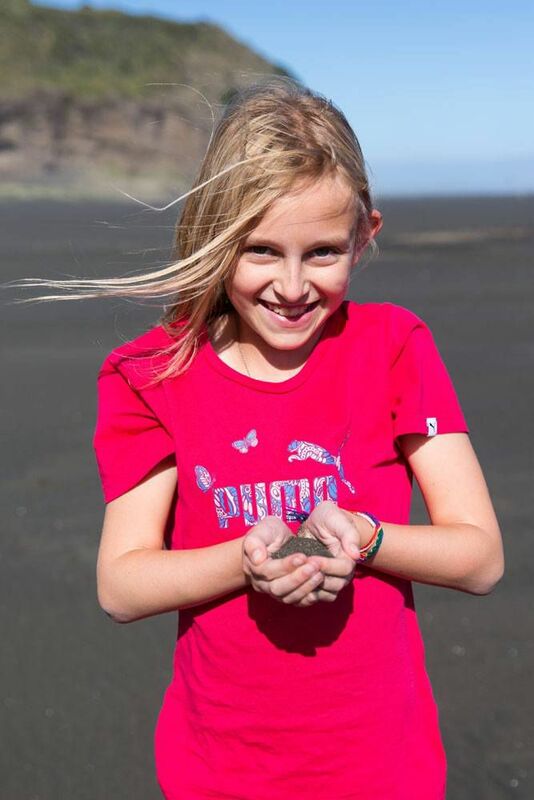 The car ride to get there took us up and over the picturesque Waitakere Ranges, out to the coast, and to the black sand beaches of Karekare. It was a beautiful day, seventy degrees and sunny, it was a Sunday, and we were amazed at how empty this beach was. We almost had it all to ourselves. It was a little too rough to get into the water, but we had fun putting our feet in the water, watching the black sand ooze up between our toes. 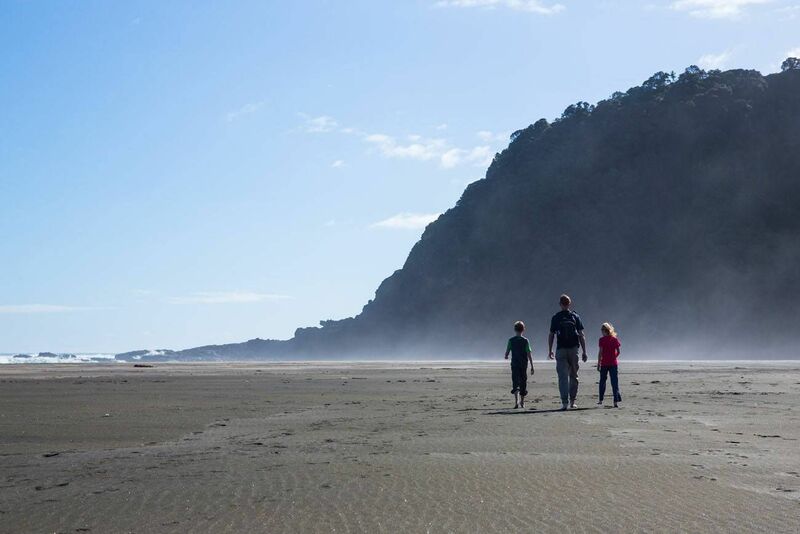 It is interesting that this beach is named Karekare, a Maori name. While in Turkey we learned that “kara” means “black.” Doesn’t it seem a bit coincidental that the black sand Karekare beach almost contains the same word for “black” in Turkish? Out in the distance we could see the Hauraki Gulf, a series of islands grouped along the coastline. We missed out on going to the Hauraki Gulf on this trip, but we will hit it on our next trip to New Zealand. There is still so much to see! I kept hearing about the Coast to Coast Walkway, an eight mile walk that takes those energetic enough from one harbor to the other. 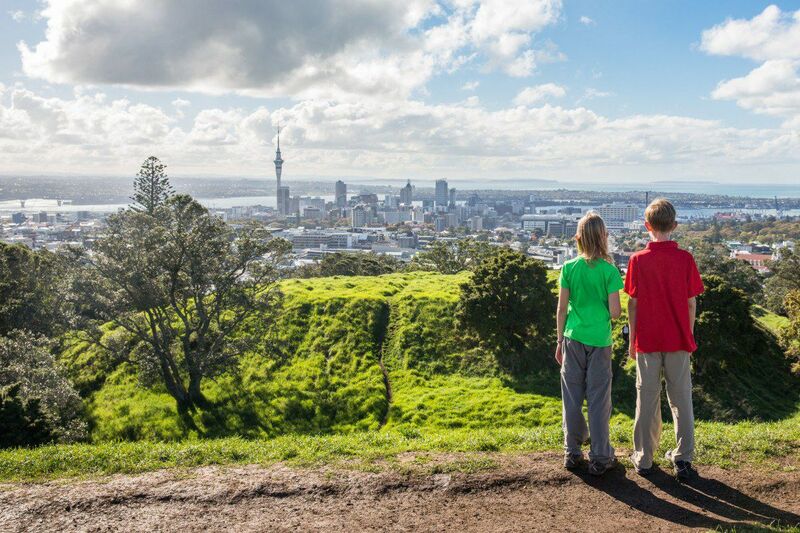 Along the way there are sights to see, such as Mt Eden, One Tree Hill, the Auckland Domain, and shopping areas, all things that appealed to us. It was just eight miles, really not that far, especially considering that we hiked twelve miles up and over a volcano just a week ago. The walk started out well. We had our first 360° view of Auckland. We walked from playground to playground, giving Tyler and Kara time to swing, zipline, and just be kids. Halfway through the walk, once we started our descent down into the city from Mt Eden, we had all grown tired of this walk. Tyler and Kara can climb mountains and hike on rugged trails for miles on end without complaint, but ask them to walk through city streets and very quickly they are bored, tired, and complain that their feet hurt. Even Tim and I had grown tired of the walk. We abandoned the walk halfway through, finding a nice restaurant for a late lunch, and decided that our afternoon would be better spent trying to escape from zombies at Escape Masters. For adults who want a glimpse into Auckland life, don’t be discouraged, this is still a great walk. 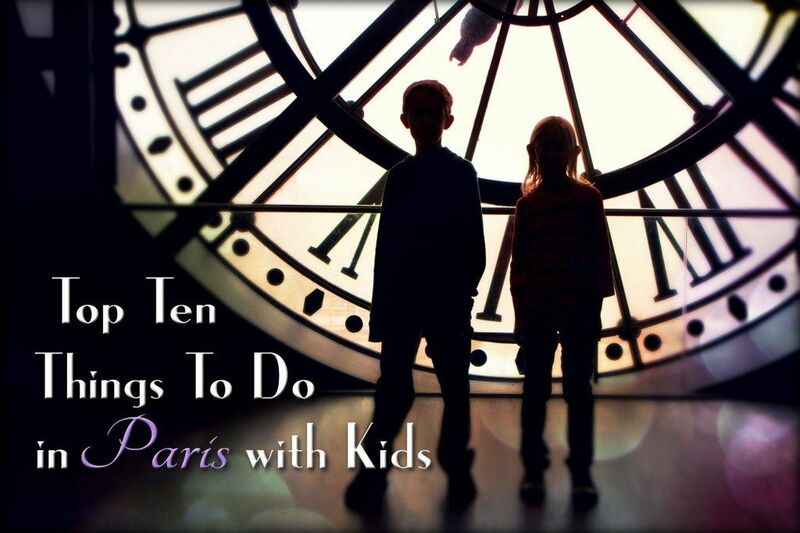 But for those with kids in tow, you might want to give this one a pass. 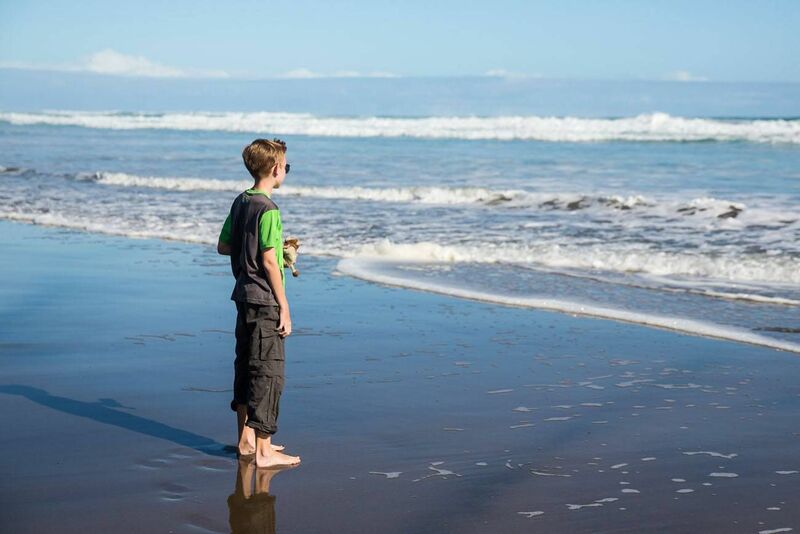 Do you want to read more about great family adventures in New Zealand? Check out this article on AdventureTogether.com. At the end of the post, you have a picture of that huge tree; where is that located? Thanks. 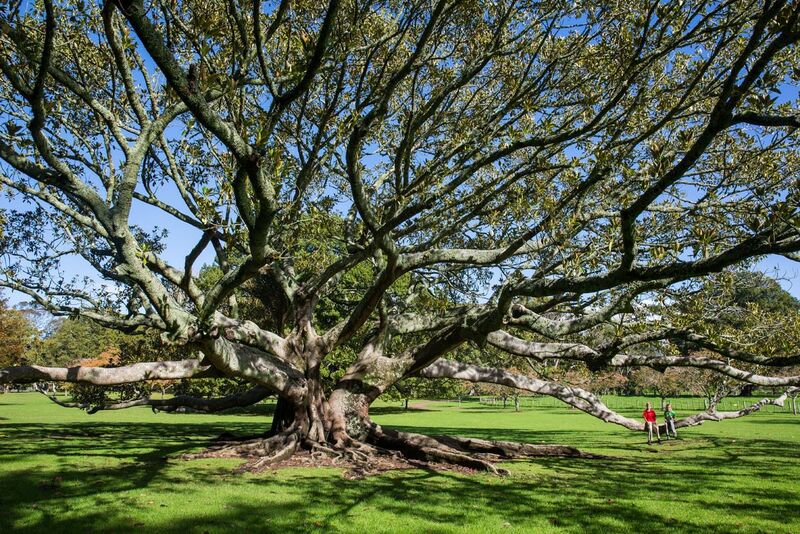 That photo was taken in Cornwall Park in Auckland. Here are the GPS coordinates: 36°53’40” S 174°47’12” E. Cheers! Hi, I really enjoy your blogs! Just wondering how you find the expenses in NZ compared to the US and other countries you have visited. Do you reckon things in NZ are expensive? Thank you! Hi, I just spent the last 2hrs reading your blog. I really enjoy your blog posts and I’m glad to hear NZ is your favorite country! I live in NZ and I’m also an avid hiker. Next time you visit Auckland I recommend you check out the walking trails in the Waitakere Ranges (in west Auckland). 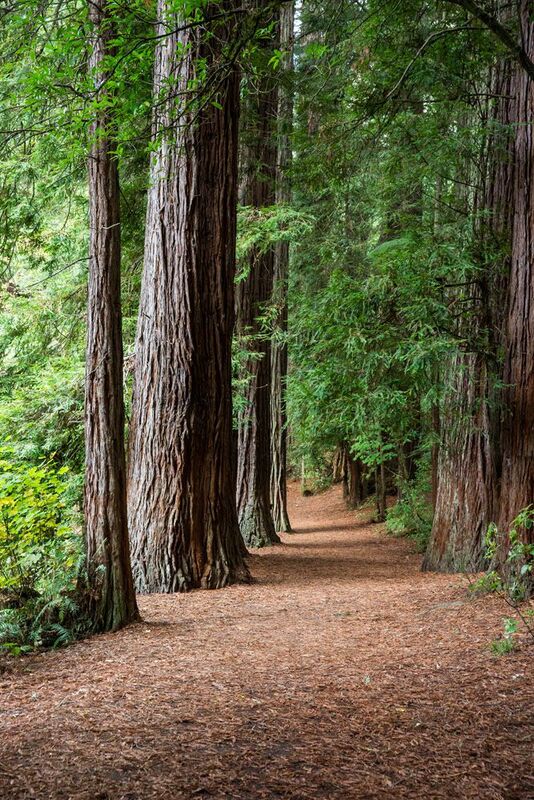 There are hundreds of half day hikes through native forests and coastlines, and most of the tracks link together to form a multi-day tramping trip called the Hillary Trail. There are the Te Henga walkway, Mokoroa Stream Track, Omanawanui Track, Fairy Falls Track… just to name a few. All these tracks are pretty easy to walk so might be a bit boring for you, but the amazing views are definitely worth it! And if you want something more adventurous you could try mountain biking in some of these trails! I look forward to read more of your blog when you visit again! In Maori, ‘karekare’ means choppy, or waves breaking. 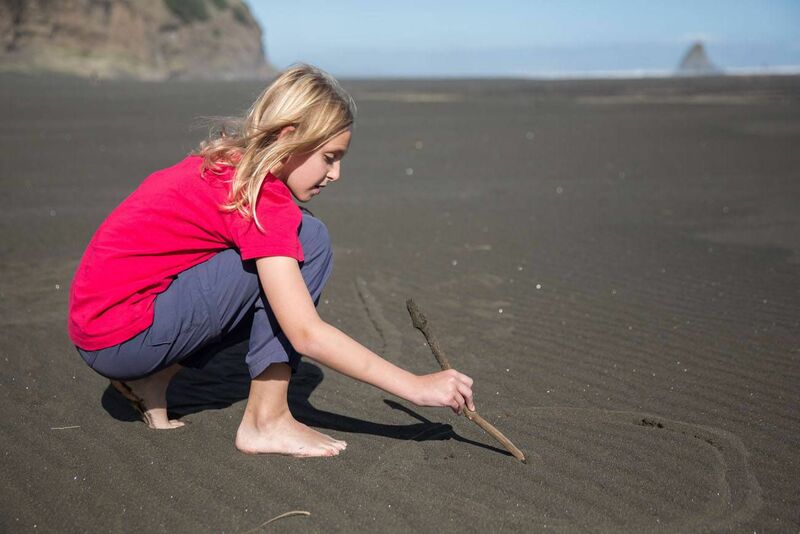 It’s got nothing to do with the colour of the sand 🙂 In Maori black is ‘pango’. long time no see ,miss you guys!